Just an hour ago, Sara took to the photo-sharing app to share a fun video of them, showing their beautiful chemistry ahead of their first film release. In the video, Sara can be seen embarrassing Kartik by screaming out his name and laughing hysterically at his reaction as Kartik is trying to stop her by covering her mouth. 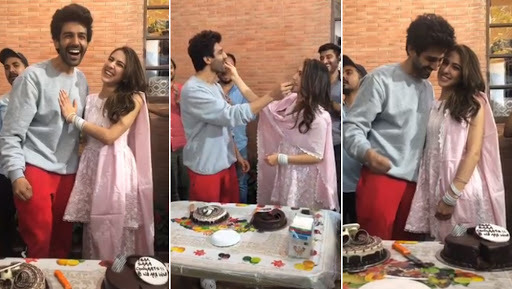 Sharing the video on her Instagram handle, Sara wrote, "And that’s a schedule wrap for me in Delhi 🎥 📷🎞😱👀🤩😫🤭👏🏻🙌🏻🤷‍♀️🍾🎂🧁🎊⏯🔙🔜‼️" The two look really cute together in this video. On the professional front, Kartik is currently gearing up for the release of Luka Chuppi, which is scheduled to hit the theatres on March 1. Helmed by Laxman Utekar, the film revolves around Guddu (Kartik Aaryan) and Rashmi (Kriti Sanon), a young couple who decide to give live-in relationships a try. However, things go out of hand when their families get involved. Meanwhile, speculation is rife that Sara Ali Khan, who was last seen in Rohit Shetty's 'Simmba' along with Ranveer Singh, has been signed for David Dhawan's remake of Coolie No 1 opposite Varun Dhawan. As per reports, Sara will step into Karisma Kapoor's shoes and the makers too have planned on to tweak the script a little to ensure that Sara gets a meatier role in the remake. Buzz also has it that the Coolie No 1 remake will go on floors in July this year and hit the screens sometime next year.